I have a soft spot for this movie. I went it for it totally blind the first time I saw it, I didn’t know it was a remake or anything, and I had a total blast. It’s stupidly entertaining and I was interested throughout, and had a good time with the humour. I also really enjoy Yelchin, and his portrayal as Charley was spot on. He really gets that silly, quirky character every time. I always love seeing a grittier vampire film, and this was it. No love story. No softness, nothing. Colin Farrell was a great Jerry, too. He was menacing, he was crazy, and he totally fit the role. Let’s not forget David Tennant, either. What a chop, but oh, so enjoyable. And then McLovin Christopher Mintz-Plasse. I wish, wish, wish he had gotten more screen time, but he did own whenever he was on. Charley is an awesome character – it is hilarious to watch this high school student desperately try to maintain a relationship, be taken seriously, be a hero, and kill a vampire, all rolled into one. I liked the effects, too, nothing over the top, but not so bad you cringe while watching. I enjoyed the movie’s pacing, too, as it gives enough time to set up and then dives right into the action, too. I really need to get to watching the original, seeing as I thoroughly enjoyed this one. 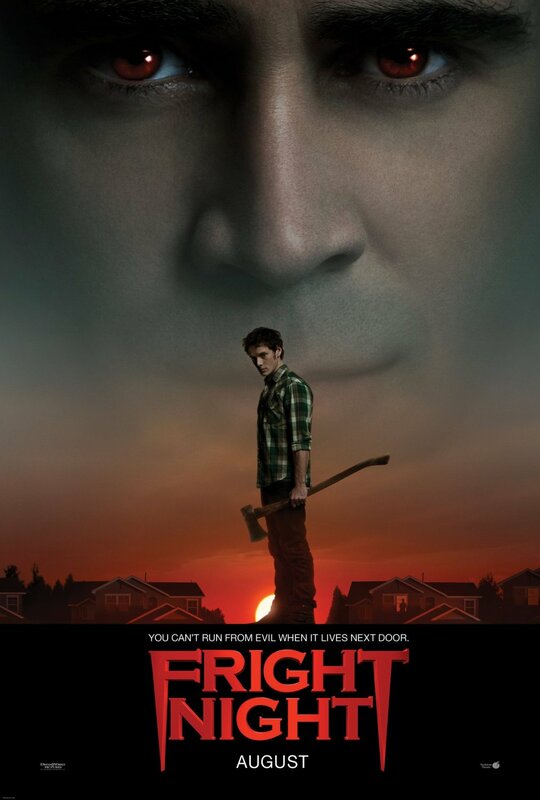 Fright Night is a fun watch that doesn’t require too much investment, and gives us nastier, more creepy vampires again, plenty humour and good effects. I could definitely recommend this movie for a watch. This entry was posted in Movies and tagged Anton Yelchin, Christopher Mintz-Plasse, Colin Farrell, David Tennant, Ed Thompson, Fright Night, Graig Gillespie, Peter Vincent, review, Vampire. Bookmark the permalink. HMMMMM never been interested in this thing. Not bad, you say?? Yeah it was entertaining for what it was, I had fun with it! I always call him McLovin too haha! For a remake, I enjoyed this quite a bit. I was a little nervous about this because I’m a big fan of the original, but this is definitely on the list of truly great remakes! Yay! Look at that! I really need to get to the original. Seems the consensus is that is was a pretty darn good remake! I’m a huge fan of this movie—I also have a soft spot for it—because although it’s a remake of an absolute classic (and probably one of the best vampire movies ever made) it tries to do its own thing and has a blast while doing it. High praise coming from you Ryan! I have so much fun every time I watch this. I’m a big fan of the original. Chris Sarandon was great as the neighbor vampire Jerry in the 85 version , but I thought Colin Farrel’s take on the character was just right for today’s audiences. His laconic Bro’ approach lives in the Vegas setting for this rendition. It’s great to hear so many people that enjoyed/loved the original liked this one so much. Seems it worked well for numerous reasons. He definitely has his moments here, and he is not usually my cup of tea! Thanks! That was one of the worst remakes ever. Give this a try – seems those that love the original really liked this one, too. Ah… The List xD Would love to hear your thoughts if you check it out sometime. I would recommend it if you are looking for a bit of fun. Hehe, yes, the ever-expanding list. My problem is I focus so much on recent releases that all the older films I need to see get pushed aside somewhat. I saw this a while back and yes you’re right, it is really entertaining. I haven’t seen the original but as far as remakes go, this was a pretty good one. Glad to hear that you had a good time with this! I like the original very much, and have been quietly reticent about seeing this, but you just flipped that and changed my mind. Great review! Yay! I would really love to hear what you think about it when you check it out! Absolutely, way more fun and believable!